You know, when we are faced with difficult issues, most times, what we do is find someone to talk to. And when we are hurt, most of us fall into the “keep talking” mode. We keep talking and talking about the same thing. The person gives an apology that does not seem genuine and we keep talking. I guess that’s what they call nagging. Well, as far as I know, talking alone is not usually the solution. Talking to your partner about your hurt is okay. But you must combine your talking with prayers. 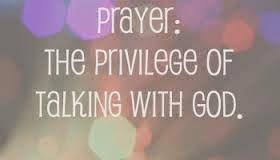 Prayer must be greater than mere talking. 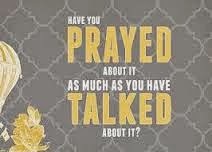 Watch the ratio of your praying to talking. I can’t say it is wrong to talk. Or else, we should begin to ask why God gave us mouths right? Looking through the book of Psalm, I realize that the psalmist spoke to God about his issues severally. I have heard people say that Christians overemphasize prayers. And I just keep wondering. I don’t know how a Christian can survive without prayers. Prayer is what keeps a Christian going. It is the sap that connects us as the branches to the vine. The communication strengthens our relationship with God. And as far as I know, God is interested in every detail of our lives. He doesn’t complain about us telling Him the things we call “trivial”. It is a true friend that you tell every single detail of your life. So, if you’re still complaining about the fact that you should let God be in the know of everything, something is still wrong with your relationship with Him. We must trust Him to handle every of our situations. We must always remember that He loves us so much. One person that will not get tired of you is God. Instead of chattering on and on about your spouse who is misbehaving, go to God in prayers about it. It’s hightime you put your in-laws who are not giving you peace in prayers instead of fighting them with your cutting words, expecting them to change. God owns the heart of men. He will direct it whichever way He deems fit. If you ask of Him, you will receive. I am a witness to what prayers can do. Nothing is too little to talk to God about. And how do I know this? I believe the meaning of everything is everything. ‘Everything’ includes the big and the small. Nothing is left out. Talk to God about everything ranging from your fears to your hurts. The admonition today: Talk less; Pray more! Change your settings to prayer mode. Do You Desire Perfect Peace?